This is the beautiful and very rare blue Larimar stone. Larimar is also known as the dolphin and mermaid stone. Larimar brings the tranquility of the ocean to the heart and mind. Larimar represents peace and clarity, it radiates healing and loving energy. The rare stone of Larimar resembles the peaceful waters of the Caribbean Sea. ABOUT LARIMAR: Larimar is a rare form of pectolite, which was discovered in the 1970s and is only found in the Dominican Republic. It has an extraordinary blue appearance similar to the color of the ocean in tropical areas. It is also known as the Dolphin Stone. 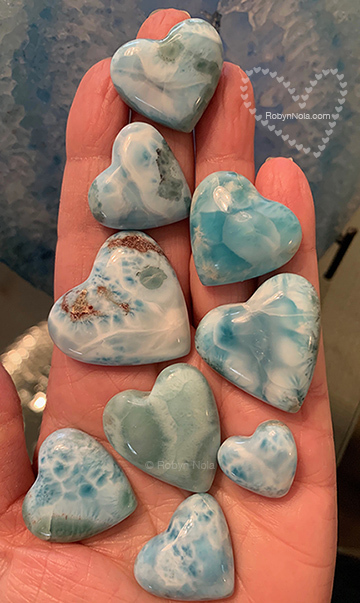 The name Larimar comes from a combination of Larissa and Mar and was given to the stone by a Dominican who named the stone after his daughter Larissa and Mar, the Spanish word for sea. 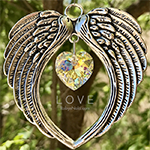 Its powers are believed to helps us view events from different perspectives, to soften and enlighten, to heal the emotional, physical, mental and spiritual body. Larimar stimulates the heart, throat, third eye and crown chakras promoting inner wisdom. It represents peace and clarity, healing and love.